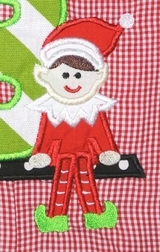 Caroline Bradlee Designs > HOLIDAYS > CHRISTMAS > Boy's Christmas Elf Custom Monogrammed Longall. 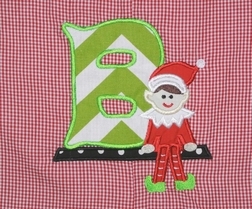 Boy's Christmas Elf Custom Monogrammed Longall. The Christmas Elf has arrived and has plopped up on the mantle. He is carefully watching all the little ones to see if they are nice or naughty! Shhhh, don't tell mom and dad.... The outfit can be made as a John John, longall, white shirt only OR white shirt and trousers. The cutest part?? Your little one's first name initial is appliqued over the elf's shoulder in lime green chevron.